WealthAdvisor.com is being auctioned off on Ebay and is available for a financial service company looking to strengthen its position in the highly competitive wealth management marketplace. To place a bid on this domain, go to www.eBay.com and search for WealthAdvisior.com during the auction period October 15th at Noon EDT to October 23 at Noon EDT. 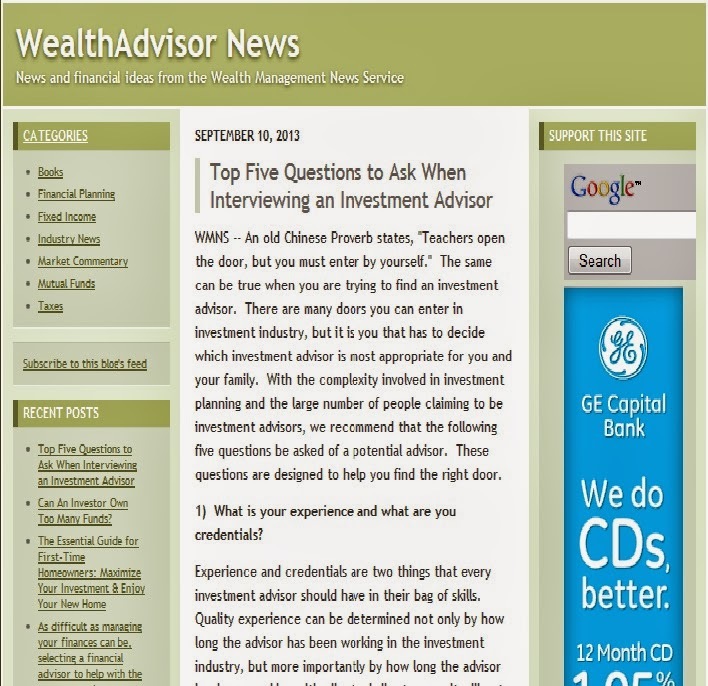 WealthAdvisor.com was first registered on December 3, 1997 and used as part of the Wealth Management News Service. 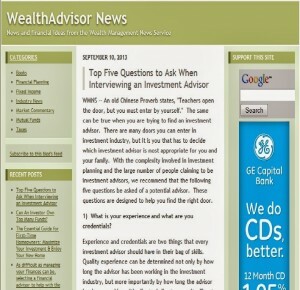 It used this site to update reporter and online investors about wealth management issues and personal finance topics. After the Wealth Management News Service closed down, the URL was maintained by William Rice, a founder of the WMNS and president of the Web Marketing Association. The URL has been sitting dormant for many years as the repository for past articles written by the WMNS. It was decided that it was time to allow WealthAdvisor.com to become an active site again. “WealthAdvisor.com also would be a great opportunity for an entrepreneur to begin an entire business advising individuals about the creating and maintaining wealth. It also could be an effective website targeting high-end financial advisors,” added Rice. A premium domain name, like WealthAdvisor.com, offers outstanding SEO benefits, but more importantly, it becomes a brandable entity and can enhance marketing efforts to wealth investors and advisors. The domain will be listed on Ebay in an auction beginning on October 15, 2013 at 3:00 pm EDT and ending on October 23, 2013 at 3:00 pm EDT. Ebay was chosen as a way to allow all interested parties to have a chance at purchasing this highly valuable domain. The domain will be placed in escrow at www.Escrow.com to facilitate transfer to the winning bidder. This will confirm domain ownership directly with the registrar before the Seller is paid. For additional information, contact William Rice, President of the Web Marketing Association, at wrice@webaward.org.